Ascended Master Mary Magdalene works with the energies of the Divine Feminine. She stands with those who need warrior energy to deal with issues in their environment. She also assists with fidelity - fidelity to partners, family and friends. Mary Magdalene is best known for the life she spent with Jesus, but in another past life she was Sarah, the wife of Abraham. Abraham was a previous life of the Ascended Master El Morya. 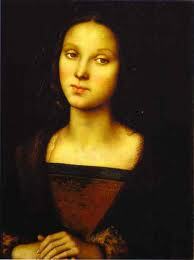 So, Mary Magdalene has been both a revered and despised woman of Christianity. She truly is a warrior woman. She coped with her circumstances and through that adversity learned to love all of humanity. And so, she ascended. She is a Master who is strong, yet gentle. There is humour and laughter, yet, show her injustice and she stands ready to give her support. If there is an external battle (bullying, abuse, or any type of external attack) and she will help when asked. If she is your Ascension Master then we suggest you use Archangel Michael Warrior oil to help you be in your power. If she were to appear to you in her physical form she has dark hair, a round face, and widely spaced eyes (as seen in the painting above). This is the closest painting I can find to her form. Her skin is darker though. Mary Magdalene is working with the Elohim Aloha. Mary Magdalene has also recently formed a working relationship with the Ascended Master El Morya to help those who are in personal crisis find their personal power, fight external battles and choose God’s Will over their own freewill. If she is your teacher and you are a 3rd ray soul, then you will have the qualities of inner strength, openness and compassion. Your soul colour will be magenta pink. 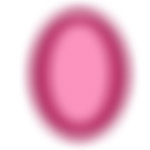 Mary Magdalene's aura colours are mid to strong pink with some magenta (as seen to the right). She is working on the 3rd ray, the pink ray of unconditional love. 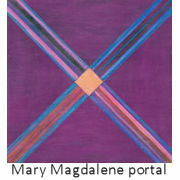 Mary Magdalene’s portal painting as shown at the top is available as a portal card or portal print. Her energy flows from it 24/7. It is wonderful to have the print sending energy into a room. You may also place the card on a chakra and receive the Master’s energy directly into the chakras.